You will never get bored with Ben 10 Omniverse games. And, Ben 10 Final Clash is one such game. Ben and his aliens are taking on the Aliens force one on one in this mind-blowing Ben 10 fighting game. Knock the aliens out in action-packed fights and win it all. Remember the Warlord Gar? Yeah, that monster who rules the planet of Khoros. He has challenged all the warrior of the galaxy to fight with his aliens in an interplanetary tournament. The winner of the tournament gets an ultimate weapon called Golden Fist. Here on Earth, Ben has accepted the challenge of Warlord and finally goes for the tournament. In this game, your only mission is to defeat the Warlord’s aliens and win the final clash to get the Golden Fist. Let’s take a look at the gameplay of Ben 10 Final Clash. 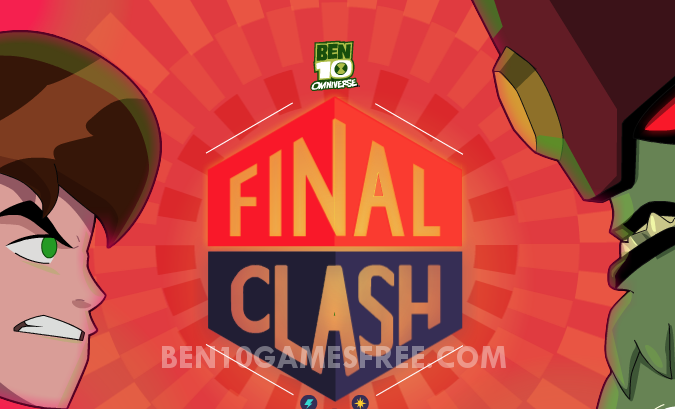 The Final Clash game is surely a core Ben 10 Fight game and if you have a fighter in you, then you gotta win this one too. As the game starts, first of all, you need to choose your character as whom you gonna play the game and obviously the most favorite choice is Ben 1o. Although, you can choose from four other initially available aliens too. Next, you have to choose the mode of play in which you want to play Ben 10 Final clash online. There are three modes in this Ben 10 game which are as follows. In the Duel Mode of Ben 10 Final Clash, it is a single one on one fight. You choose your player and the one with you want to fight. After choosing the players, there begins a three-round challenge. To win the game, you must win at least two out of the three rounds. When you play this game in story mode, you get to know how Warlord invites warriors and you can accept the invitation in form of one of the characters on the screen. As you choose your character for the tournament, the game begins. There is series of battles against different alien warriors in the tournament such Attea, Gokstad and Malware etc. To win each battle you need to win at least 2 out of 3 rounds of each battle. Pro Tip: For the final battle in story mode, choose the alien having extra Agility. Unlike other two modes, Ben 10 Final Clash game has an option for two-player mode and it is called versus mode. Both Player can Select their characters and fight against each other. The one who wins 2 out of 3 rounds wins the game. So, That’s it guys! Are you ready to win the game and grab the Golden Fist? Play the game now and prove yourself to be top Ben 10 fan. Defeat all Aliens and Win all Battles and Let Warlord know who is the Best! Good Luck! Don’t Forget to give your rating for Ben 10 Final Clash Game and share your tips and tricks to win this game in the comments section below.